The earliest style of watches were pocket watches and these were worn by both men and women. Most men attached their watches to their clothing with decorative watch fob and women usually used a decorative chain. Many men today still appreciate the look of a classic pocket watch and while there are not as many fob manufacturers today, the ones that are still making fobs, make very nice ones. The other style of watch is the wristwatch. These come in a variety of different styles and prices. The traditional style of wristwatch is the analog, which is also what most pocket watches are, too. The typical analog watch face has three hands that move around the watch face. The fastest hand is the second hand, the next fastest shows the minutes, and the shortest hand keeps the hour. Interestingly, analog clocks and watches were at one time the only watch face available, and now, many people can no longer tell time on an analog clock. When you shop for an analog watch, you will need to consider how you would like to keep it moving. Many watches move with a mechanical movement, where the user needs to wind the watch on a regular basis. Many of the today’s watches are battery-powered and need to have the battery replaced annually. Other watchmakers use automatic movement where the watch is powered by the users movement. If you want something that has a more modern feel, a digital watch might be the way to go. These are the watches that use a LCD display to show the time in numbers rather than on a clock face. Digital watches are usually much less expensive than analog watches because the digital watches to not require the same amount of work to create. One of the most popular types of digital watches today is the sports watch. These are used by endurance athletes to keep track of the time and the distance they have traveled. Sports watches will often keep track of heart rate and they often have stopwatch functions, too. Many of the top sportswear companies make sports watches. When you are shopping for a watch as a gift, you will need to consider the purpose of the watch. Of course, the actual purpose is to tell time, but people wear watches for a few other reasons. Since most people today have mobile phones that tell time, watches are of little use for many people. So today, people wear watches for the fashion and status they present. Athletes use sports watches to keep track of their times. Men and women who like to scuba dive and spend time in the water, will also use their watches for time keeping because their mobile phones cannot do the job. 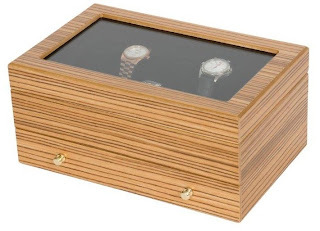 Visit Chasing Treasure to select a wooden watch box to house your gift today!